Very nicely crafted! Thanks so much for sharing with us here at 623 Avenue Create! Wonderful Nautical card- love the embossing on Watercolor paper and the shimmer is awesome! I think the sentiments both look great- and bet he will be so touched you made a special card for him! Hi Maxine. Lovely to see you in the Playground again - and I do love this card. A real sense of movement there and the glimmer is beautiful. Sure to be appreciated for the nice clean lines. This is amazingly beautiful Maxine! Sending all good wishes for a very Merry Christmas ! It's beautiful, Maxine. I love the white embossing and wonderful water coloring. Thanks so much for sharing with us at Penny Black and More! Good luck and hope you'll come join us again in January! ahh Maxine a really cute card .. well done .. love it! great idea for male card. A gorgeous card Maxine and a lovely marine scene. Thank you for sharing your lovely card with us at Penny Black and More and we hope you will join us again next month. Very pretty! Love the sparklies! What an amazing watercolored card, Maxine. This card is in ways much like YOU...beautiful from the inside out! Thanks so much for sharing it in our challenge. I hope that your CHristmas was wonderful, my friend. I am SO grateful to God for you. THanks for sharing. It turned out brilliantly in the end! Gorgeous card, love the shimmer! 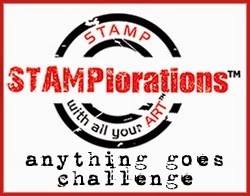 thanks for joining us at Fashionable Stamping Challenges this time! Beautiful card! Thank you for joining our December Anything Goes Challenge at Great Impressions. Wishing you a Prosperous & Happy New Year! This is gorgeous my friend! Even the smudged sentiment came out well like it was intended...LOL Love the shimmer on this creation! Know that this card is excellent and I know the recipient truly appreciated it. Thank you for joining our Challenge at 613 Avenue Create. There's still a little bit of time left to join this week's Challenge, hope you link with us again. God bless and Have an Awesome New Year!